The AC3 is beautifully constructed and delivers an ear-pleasing sound. However, its high output impedance and fickle connectivity compromise versatility and convenience. dB MAGIX may not be synonymous with prestige or sonic perfection, but they’re an ambitious company looking to improve audio quality for the average user. Their AC3 has been oft-discussed online; a convenient dongle-style DAC/AMP that offers a taste of dedicated quality from any lightning or USB-C sporting smart device. On top, it looks undeniably great, sleek in design and solid in construction. The AC3 offers a handy package at an attainable $60 USD asking price. You can read more about the AC3 on their website here. I would like to thank dBMAGIX very much for their quick communication and for providing me with the AC3-C for the purpose of review. All words are my own and there is no monetary incentive for a positive review. Despite receiving the DAC/AMP free of cost, I will attempt to be as objective as possible in my evaluation. The AC3 easily has the best build quality of any dongle-style DAC/AMP I’ve tested. Its cylindrical aluminium housing has great density, imbuing a feel of genuine quality. This is accentuated by an eye-catching design with a sleek black outer shell and brushed silver endcap. This provides nice contrast in colour and texture portending towards a well-designed, well-constructed package that feels sturdy for daily use. The AC3 has no controls nor does it pass through remote commands and mic signal from attached headsets with an inline remote. This will surely irk those that value calls and absolute convenience on the go. Besides this, the DAC is very solid. It connects to the source device via a flexible cable whose shorter ~3cm length enables the DAC to be hidden easily behind a phone or DAP. Both ends of the cable have basic strain relief that should help to prolong its lifespan. 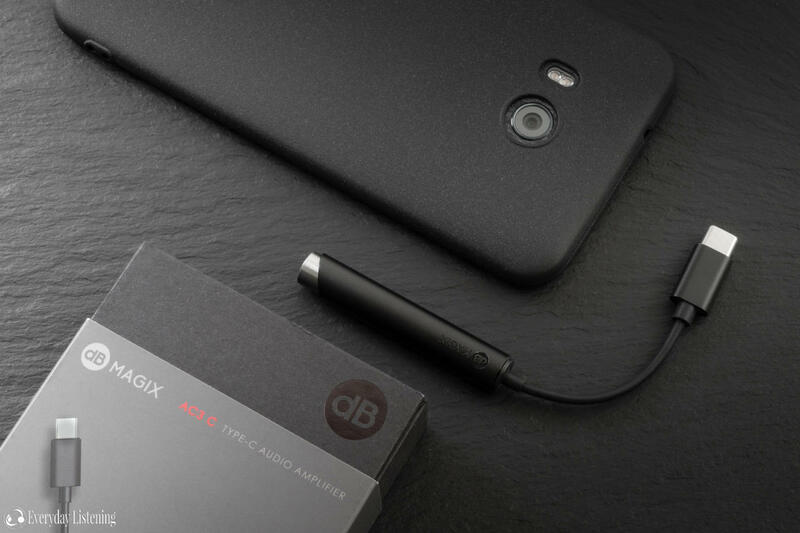 dBMAGIX provide the option of either a USB-C or Lightning connector to cater towards both IOS and Android users, the USB-C model has the added benefit of working with PC’s though functionality is gimped. I was pleased to see that the USB-C connector was of the higher quality extrusion kind as opposed to pressed metal. This ensures a snug fit in the connector and greater engagement long-term, where pressed connectors tend to loosen and become prone to intermittent connection. The DAC was plug and play on both my HTC U11 and Samsung Galaxy S8, both running Android 8.0. Audio was automatically routed through the DAC as opposed to the jack on the S8 and the U11 indicated that an external audio adapter was in use. 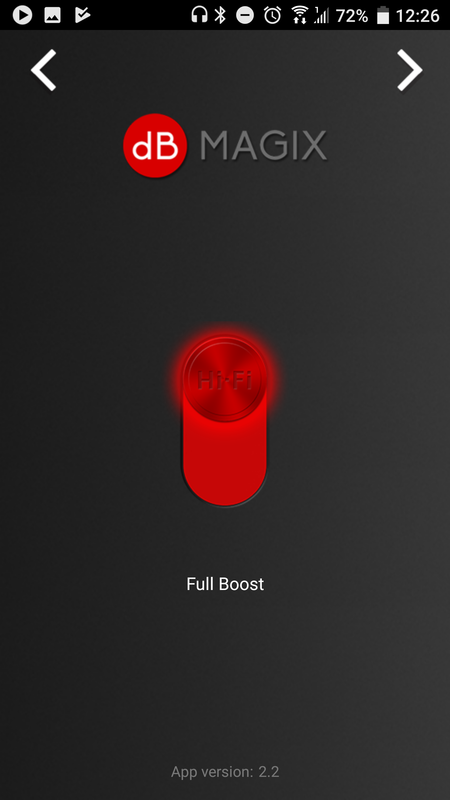 dBMAGIX have a smartphone app that enables “Boost” and “HiFi Boost” modes that provide incremental increases in volume. Initially, I assumed the modes altered the gain of the amplifier, but further testing revealed that it is more likely a digital profile. The app also offers the ability to update firmware. Of note, the DAC remembers the setting it was last set to even if the app if uninstalled or the DAC is used with a different source. As the DAC has no internal battery, it does affect the runtimes of the attached device. I didn’t notice huge battery drain on my U11 with the AC3 drawing similar power to the factory included dongle. As the AC3 has been optimised for low power draw, it automatically turns off when no headphone is connected. However, the switch is overly sensitive, turning off with small bumps and cable tugs making it more fickle than most during portable use. This is especially problematic with custom cables that had a difficult time locking into the AC3’s port, where my other dongle DAC’s had no issue. It’s not experience breaking, but certainly annoying and I wish this feature could be disabled within the app. Unfortunately, it’s likely a hardware feature. The AC3-C also worked with my windows 10 laptop and no driver install was required. However, volume becomes locked at 100% meaning users will have to digitally adjust volume within their listening app (which isn’t always possible). Moreover, as the amplifier is always at full volume, this introduces a fair amount of background hiss and distortion producing a rather subpar listening experience. Use with PC’s is evidently not ideal nor what the AC3 was intended for. Perhaps this can be remedied in future with a dedicated Windows driver or firmware update. Smartphone manufacturers reason that the move away from an integrated 3.5mm jack and audio processing hardware will increase sound quality. However, rather than some exotic ESS Saber or AKM chipset, the AC3-C actually implements the Qualcomm Aqstic WCD9335 DAC chip that’s included with some better Snapdragon 820 devices such as the HTC 10. Personally, I find the ESS Saber DAC’s in LG’s V-series phones and the Burr Brown powered ZTE Axon 7 more resolving yet, however, the amplifier plays just as important a role in sound quality and it’s still a capable chip that supports all the codecs smartphone users are likely to use. It has modest power draw and by separating the audio hardware from the rest of the phone, it’s possible to reduce distortion and interference. dBMAGIX were sure to put particular emphasis on their choice of AMP chip that claims to be considerably better than that in any standard Android phone. Implementing a Burr Brown OPA1612 chip, the AC3 indeed delivers considerably more output power, lower stereo crosstalk and lower distortion than essentially any integrated amplifier. However, I was disappointed to find that it has a very high output impedance that will skew the signature of low-impedance multi-driver in-ears, though it does deliver a pitch black background with zero hiss in return. It doesn’t rival a dedicated DAP in output power, but does provide a more controlled sound than one would expect from a dongle, just be mindful of its output impedance with earphones such as Campfire’s Andromeda, the effects are not kind. The culmination of a moderately resolving DAC chip and reasonably powerful AMP produce a compelling listening experience that’s a clear step up from most smartphones and included dongles. Sub-bass is tight and agile. That said, it lacks the extension and power of dedicated sources with higher output power and a lower output impedance, especially noticeable with portable headphones. Mid-bass, though slightly warm, is well-defined and controlled while upper-bass is restrained, leading into a tonally transparent midrange. It delivers pleasing pace and dynamics, even servicing the planar magnetic Oppo PM3 and effectively driving my high-impedance earbuds. Mids are tonally neutral and accurately bodied, however, they are notably darker than neutral, delivering smaller, more laid-back female vocals. On the flipside, this creates a very smooth vocal reconstruction and the AC3 sounds very organised even if it isn’t the most revealing source. Notes are well resolved and the added density aids this impression by filling in body and avoiding artificial clarity enhancement. Treble is also a touch laid-back, but there’s plenty of lower-treble, aiding detail presence. Middle-treble is most notably attenuated which, combined with its laid-back upper-midrange, produces a pitch black background and a very clean overall presentation. On the contrary, extension and resolution aren’t exceptional but above average considering the source’s asking price and form factor. The AC3’s greatest asset is likely its soundstage which, though not especially layered, expands well in all axis. With greater expansion and retention of accurate note size comes increased separation, further heightened by its clean background. Imaging is solid if not pinpoint precise and these features culminate to create a more nuanced and immersive listen. HTC Dongle: The HTC dongle actually has a lower output impedance therefore better suiting low-impedance multi-drivers, however, it does still skew their signature. Otherwise, the AC3 has a more controlled low-end combined with better extension and definition. Its midrange is darker where the HTC output is more vivid but also thinner. The AC3 has more detail presence and it has a darker background. The AC3 sounds a lot cleaner overall but also not as vivid, I would suggest the AC3 is more balanced by comparison to reference sources, however. The AC3 has a considerably better soundstage, it is more spacious and more layered, separation is enhanced. The AC3 also has a lower noise floor though the HTC dongle isn’t bad in this respect at all. Hidizs Sonata HD ($25): This dongle is quite a wonder, it’s cheap but has a low-output impedance and solid power output. In fact, output power is higher than the AC3 and it does so without introducing any hiss. That said, for in-ears with a flat impedance curve such as single dynamics and the Custom Art Fibae lineup, the AC3 is more resolving and balanced. The Sonata HD is rather slightly on the brighter side, it has a bigger low-end at the cost of introducing some bloat and its midrange is less tonally transparent. The AC3 is cleaner and it is more detailed. Its lower-treble is more linear where the Sonata HD has less detail presence and a brighter background. The AC3 has a larger soundstage with better separation. Still, the differences are fairly small and users of low-impedance monitors will still find the Sonata HD a nice alternative. The AC3’s main point of interest has been its design; it’s easy to fall in love with its tank-like build, dense in-hand feel and gorgeous two tone design. However, spending time with the product reveals more than just flashy aesthetics, it’s a find sounding source too. Though its components aren’t exotic, it’s a pleasing blend of elements that provide a clean, well-detailed listen. Of course, no product is perfect and the AC3 has its share of caveats, some quite significant. LG V/G6/G7 users likely won’t find any benefit in purchasing this DAC/AMP and it doesn’t pair well with Windows devices. Its high output impedance is something to strongly consider for multi-driver IEM users and its overly sensitive internal power switch can irk for custom cable users. Still, for prospective buyers listening from single driver in-ears or portable headphones with standard cables, the AC3 is an ear-pleasing source in a practical form-factor. It’s built to withstand daily life and offers a very complete solution for jack-less Android phone users.